Support Champaign’s new chamber music experience for the 21st century! DoCha was created and incubated in downtown Champaign by today’s most in-demand and dynamic international classical music artists. These musicians also happen to live in Champaign County, teach at the University of Illinois School of Music, and have a desire to give back to the place they call home. Around the world, typical audiences pay $30 to $75 to hear their great performances. In downtown Champaign, our community can experience great chamber music for FREE! 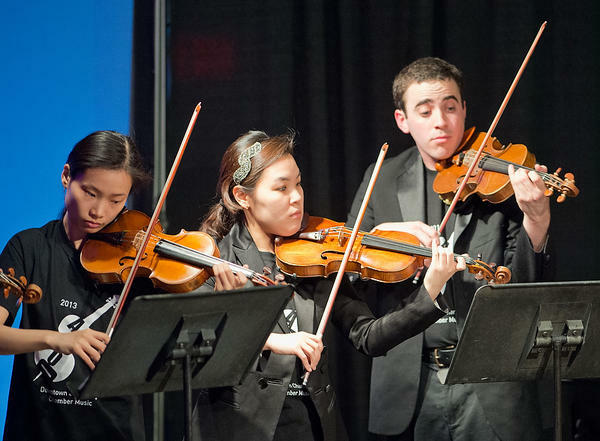 These free chamber music experiences are only made possible through the visionary support of generous individuals and organizations in this community. Consider making a gift to DoCha and help bring adventurous, world-class chamber music to downtown Champaign. Your support will ensure that these unique experiences can continue to be free. DoCha welcomes gifts of financial support, gifts in-kind, and volunteer time and energy. Make a gift to support the festival’s general operating costs, or make a special gift that reflects your particular interests. DoCha will reach hundreds of youths in Champaign County by presenting free, daytime programs for young people and their families in partnership with the Orpheum Children's Science Museum. DoCha and the Orpheum will offer engaging, fun, and educational chamber music presentations for school children through organized school field-trips as well as open-to-the-public family programs. Make a gift of $250 or more to become a supporter of our Young People’s Series. Underwrite the participation of one of our artists with a gift of $500 or more. Your gift will ensure that DoCha can continue to invite the world’s most in-demand and exciting musicians to participate in free performances for Champaign audiences! You will be invited backstage to meet the artist you sponsor. Your donation to DoCha will be tax-deductible through our fiscal sponsorship of the Community Foundation of East Central Illinois a 501(c)(3) tax-exempt organization. Contact Paul Redman, executive director, at 773-217-0022 or dochamusic@gmail.com for more information on making a gift, making an in-kind donation, volunteering, or becoming a corporate sponsor. Make a secure, online gift now! Note: You must type DoCha in the text box under Designation (Optional) for the funds to be attributed to our account. Copyright © DoCha Music Festival 2019. All rights reserved.